ULTRA - magnetically driven or Mag Drive Pumps with no foam pre-filter filter are the ideal solution for use in decorative water features such as decorative stone, spitters, or brass features. 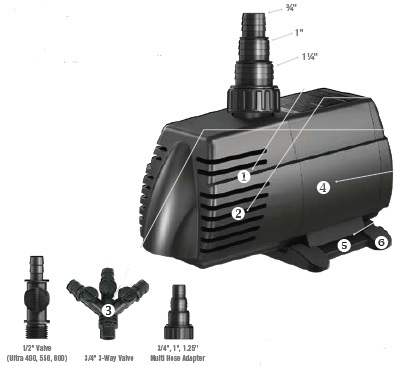 The Ultra Pump is a submersible magnetic drive pond, fountain, and water feature pump. Ultra pumps are ideal for supplying water to fountains, water features, external filters and spitting ornaments. 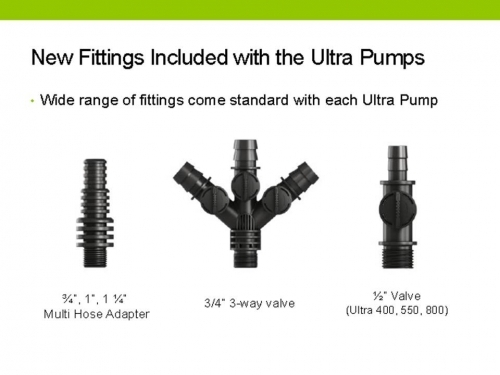 The included 3-way diverter valve & multi-hose adapter provide great installation flexibility, as well as allowing you better control over your water features. These little pumps are almost maintenance-free. They are hard to overheat as long as they are kept submerged, and can run for years without failure -- IF they are kept clean. Two things will kill them; one can be repaired, one can’t. The first situation is pretty common – a small piece of mulch or twig gets past the prefilter and jams the impeller. When the flow stops, most folks’ first impulse is to unplug and re-plug the pump, to free the impeller, but this can backfire and snap the ceramic shaft that the impeller spins on. Luckily, the shaft, impeller and magnet assembly can usually be replaced at a modest cost. Tip #2 When flow stops, unplug the pump, check for blockage and make sure the impeller can spin freely BEFORE plugging the pump back in. Use a pencil or screwdriver to rotate the impeller one full turn. If it doesn’t turn freely, remove the impeller housing, find the debris and remove it. This goes for all pumps. The second situation that’s especially damaging to Mag Drives is to have the pump sitting directly in the pond, down in silt or sediment. Constantly pumping abrasive grit can wear the bushings that the impeller shaft rides in. Once worn, the shaft will start to wobble and the Mag will start to fail. Usually, the bushings are difficult or impossible to replace, so that’s it for the pump. Tip #3 Either mount the pump in a skimmer, or keep any pump that’s sitting in a pond a few inches off the bottom, on a flat stone, to keep abrasive sand out of the pump. SELECTING A PUMP: Choosing a pump for a water garden should be based on a few job requirements. Desired flow, pumping height and electrical costs are all factors that need to be considered. The higher the pump needs to push water, the less flow you are going to get out of that pump. The Aquascape Pond Kits come with pumps sized to turn a pond over at least once per hour. You should try to make sure your pump application follows the same guideline. If your applications' pumping height is close to maximum pump shut off height, substitute the next larger pump available. High efficiency pumps are a higher quality, will last longer, use less electicity, warrenteed longer, cost more initially but will save you more money over the life of the pump. If project budget constraints are a concern, use a less expensive low efficiency pump. 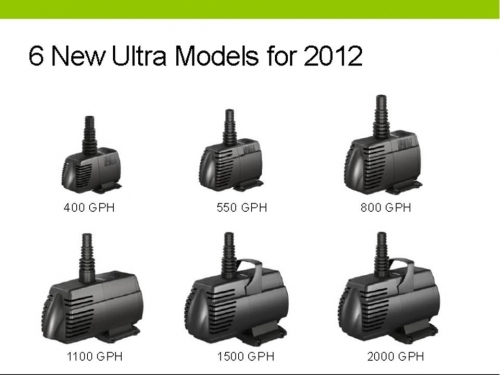 The Aquascape Ultra™ Pump will provide years of trouble-free operation when properly maintained. If your Ultra™ Pump stops working try cleaning the protective input strainer and sponge. Another tip is to remove and clean the impeller and impeller housing with a mild acid-like white vinegar and toothbrush. This will remove any white scale build-up and allow the pump to run like new again.